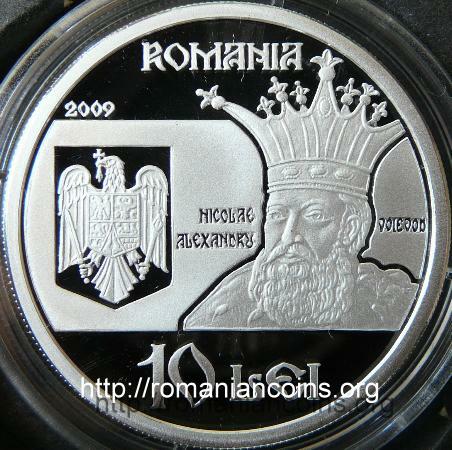 Obverse: ROMANIA, year 2009, coat of arms of Romania, face value "10 LEI", a wide horizontal matte band, matte voivod's effigy and above inscription NICOLAE ALEXANDRU VOIEVOD Reverse: Iachint from Vicina, the first metropolitan of Walachia, inscription SF. IERARH IACHINT meaning "HOLY HIERARCH HYACINTH", a wide horizontal matte band, church Saint Nicholas from Curtea de Argeş, inscription 650 DE ANI DE LA INTEMEIEREA MITROPOLIEI TARII ROMANESTI meaning "650 YEARS FROM THE ESTABLISHMENT OF THE METROPOLITAN BISHOPRIC OF WALACHIA"
Nicolae Alexandru inherited the throne of Walachia from his father, Basarab the Founder. He ruled from 1352 until 1364, the throne being occupied afterwards by his son, Vladislav Vlaicu. During the reign of Nicolae Alexandru, the Patriarchy of Constantinople recognized officially the existence of a church hierarchy in Walachia, thus having the country also recognized by the Eastern Orthodox Church. The figure of Nicolae Alexandru is the one from the monastery church of Cîmpulung, founded by Basarab I and finished by Vladislav Vlaicu. The painting was redone at the beginning of the 19th century. The tombstone of the voivod resides inside this church. The Walachian church entered officially in 1359 under the protection of the Patriarchy. The Metropolitan of Walachia was to become a member of the Holy Synod of the Orthodox Church and anointed at Constantinople. The first metropolitan of the country, Holy "kir Hyacinth" of Vicina (town in Dobrogea on the Danube), had actually moved for some time at the court of the Walachian voivod, where he was "very well seen", as a letter from the patriarch to Nicolae Alexandru shows. Iachint died in 1372, having been succeded by a former prior of the Cutlumuz monastery of Mount Athos, Hariton. 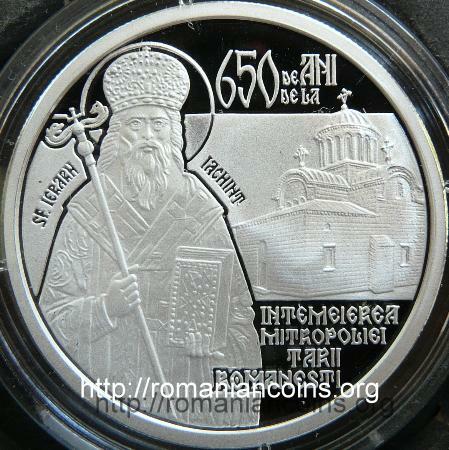 The Romanian Orthodox Church canonized Holy Iachint of Vicina on July 8th 2008. 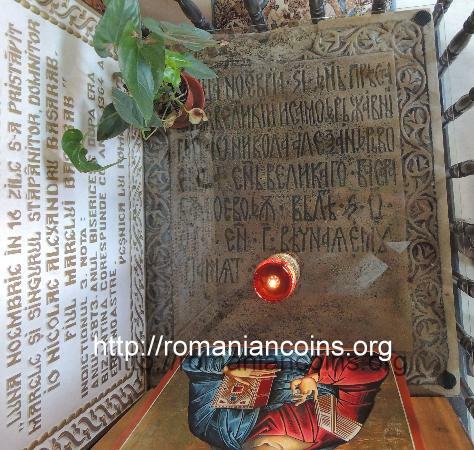 The princely church of Curtea de Argeş - foundation of the first Basarabs - appears on the coin because, since the town is one of the first Walachian capitals (besides Cîmpulung), it is likely that the first see of metropolitan Iachint was there.